To be honest, getting a private tour guide when we travel isn’t something I normally do. I have two reasons for that. One, I’m independent and I like doing things at my own pace. Two, and more importantly, I’m introverted and have a tendency to space out. 😆 I stutter when I’m nervous too which is why I’ve learned to shy away from prolonged social contact. That’s not something I can do on a private tour with the interaction being so intimate. But after putting on my grown up pants and going on a private tour in Saigon, I understood what a benefit it is to have a local by your side. 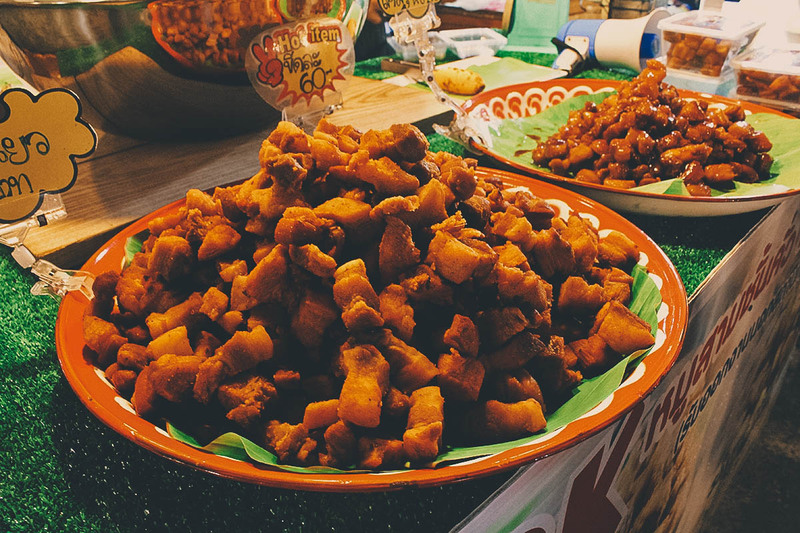 It becomes particularly valuable when you travel for food like we do. 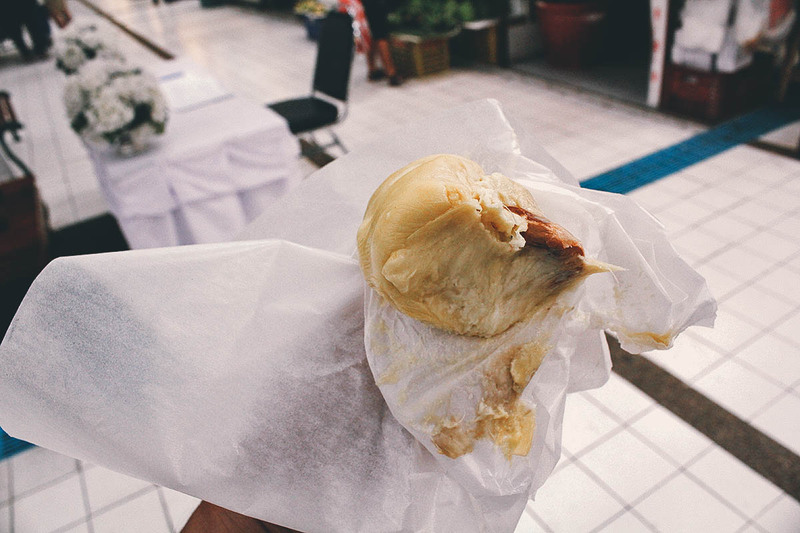 After all, who knows local food better than a local? 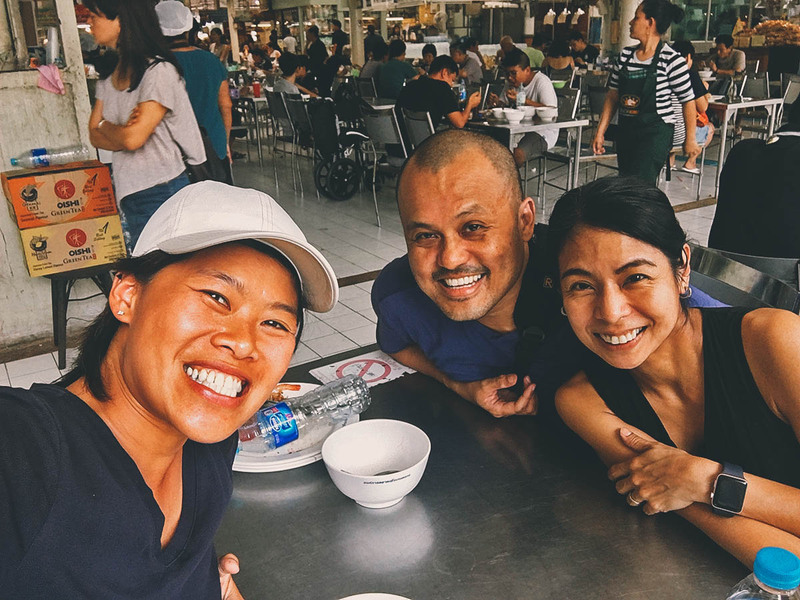 Thanks to our private tour guide, we got to experience some of the best local eateries in Saigon, places that we never would have found on our own. I’m talking about tiny hole-in-the-walls that have been around for generations. It was a fulfilling experience and it proved to me that good things really do happen when you step out of your comfort zone. So when Natt of Your Thai Guide reached out and offered to give us a private tour in Bangkok, I didn’t hesitate. I just put on my grown up pants and sad yes. I knew good things would again be coming our way. Your Thai Guide is a private tour provider in Thailand. They operate mainly out of Bangkok but they offer private tours in other parts of the country as well. Itineraries are entirely customizable and tailored to what travelers want to see and do, so costs vary. 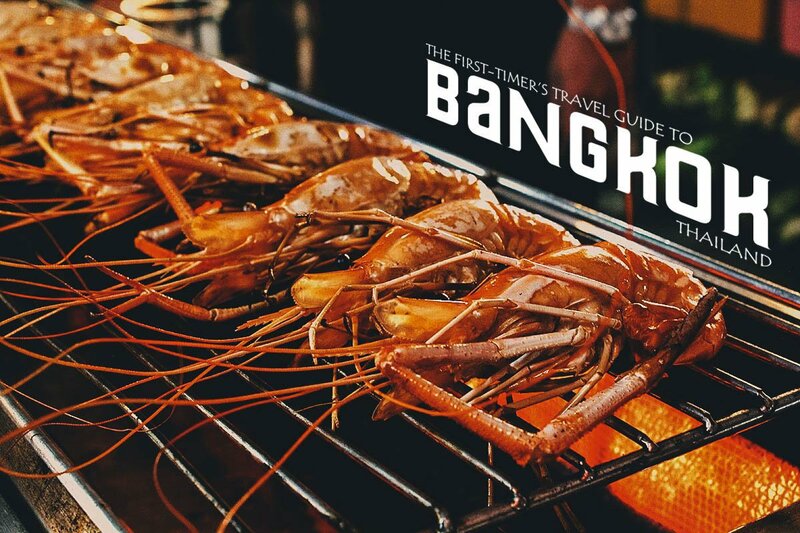 If you’re unsure where to begin, then you can check their website for the most popular tour requests in Bangkok and other locations. 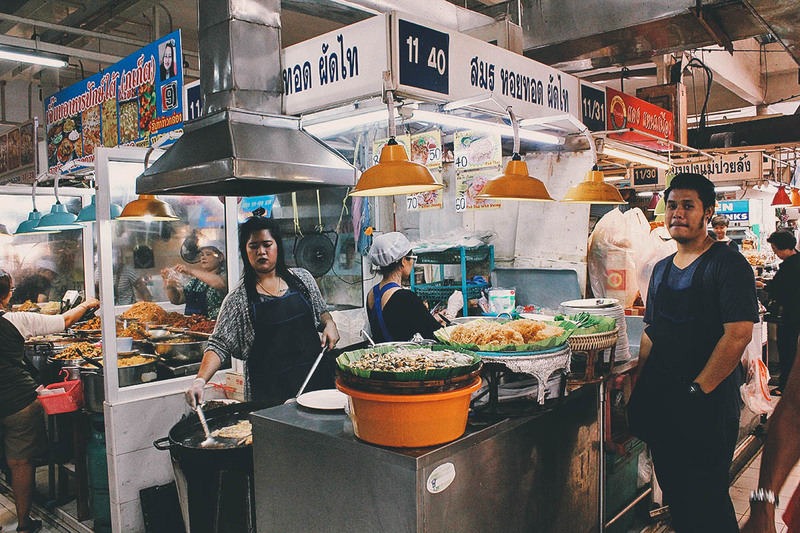 In our case, we were interested in food so Natt designed an itinerary which featured some of Bangkok’s most popular local markets. 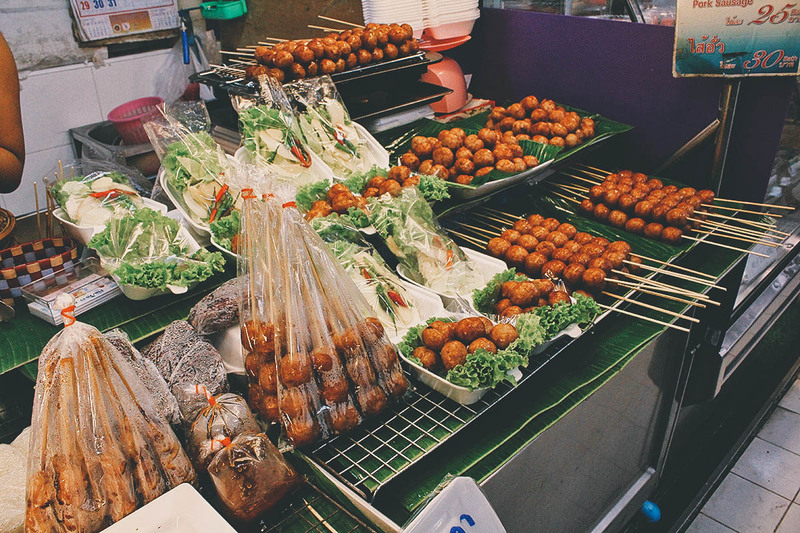 We visited Khlong Lat Mayom Floating Market, Chatuchak Market, and Or Tor Kor Market. This is a long post with lots of pictures so you can click on the links to jump to that specific section. Out of curiosity, we asked what some of her oddest tour requests have been. She told us about one traveler who wanted help getting a full back tattoo, so she spent two full days with him at a Bangkok tattoo parlor. As described, tour itineraries are tailored around what you want to do. Natt met us at our AirBnB rental at 8AM and we proceeded to Khlong Lat Mayom Floating Market. Originally, we had planned to pair this trip with a Bangkok canal tour. However, we were in Bangkok during the exact time as the Royal Cremation Ceremony (25-29 October 2017), so access to the canals and some parts of the city were limited. 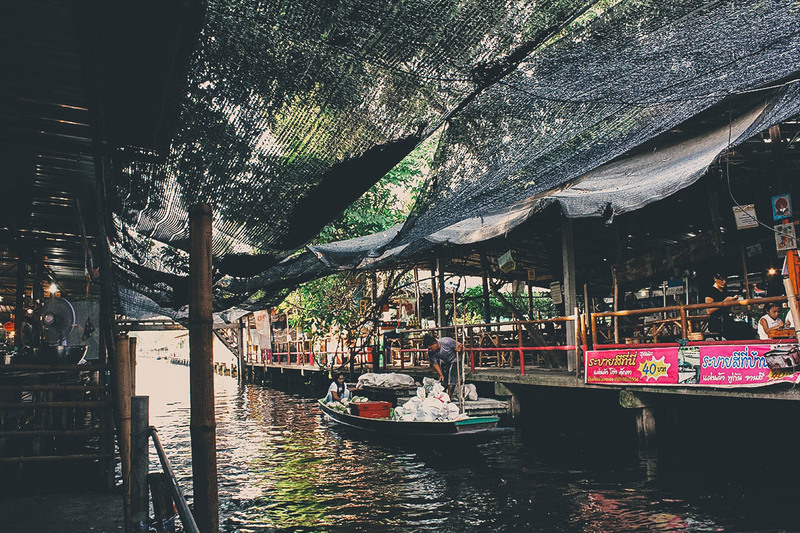 Located on the outskirts of Central Bangkok, we proceeded to Khlong Lat Mayom Floating Market by taxi instead. 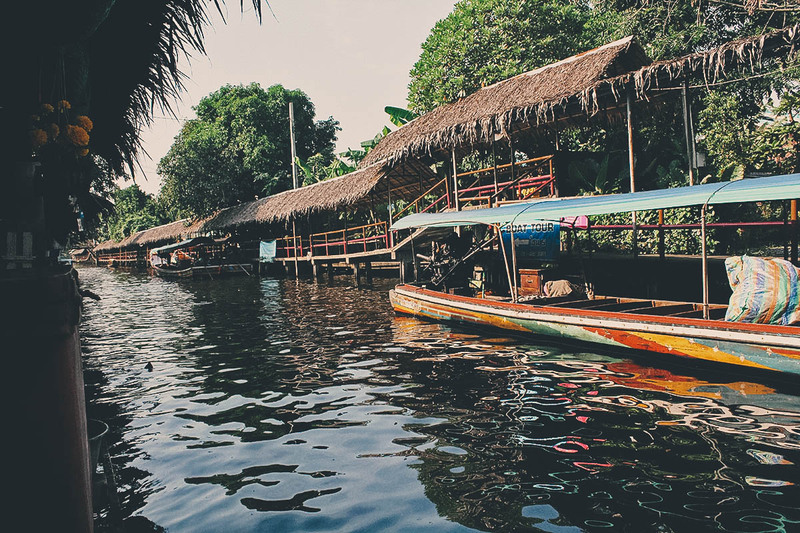 Bangkok and its surrounding areas are known for its vast network of canals and waterways. People relied on these canals for transportation and over time, merchants began selling wares directly from their boats. They would congregate in certain areas in Bangok, eventually giving rise to these floating markets. 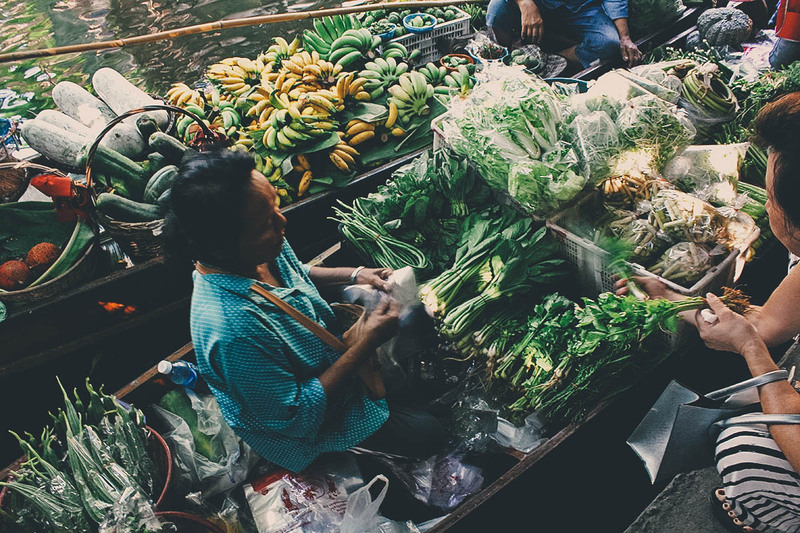 Today, floating markets have become a popular tourist attraction in Bangkok. 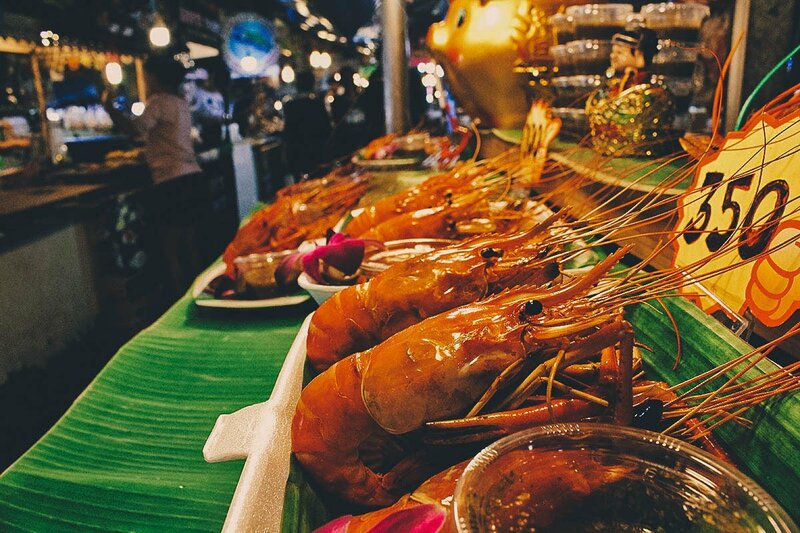 There are several to choose from, the biggest and most popular being Damnoen Saduak and Amphawa Floating Markets. 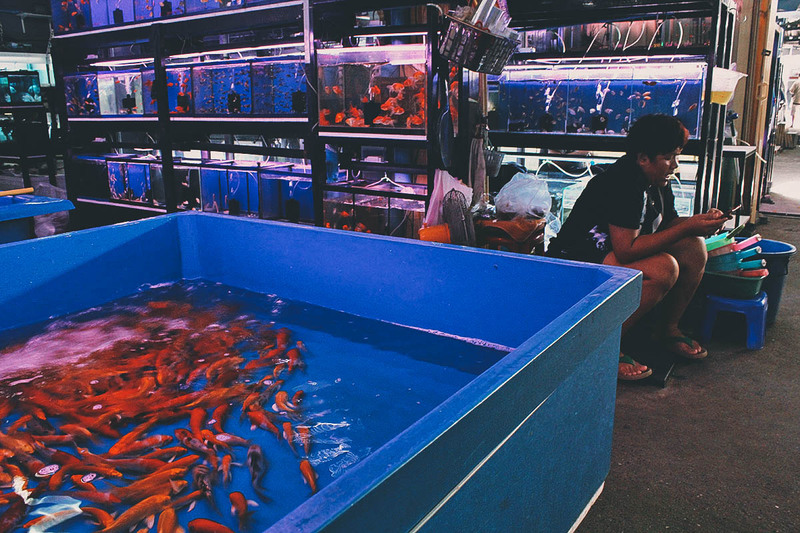 Both are almost two hours away from Central Bangkok and have become very crowded and touristy over the years. 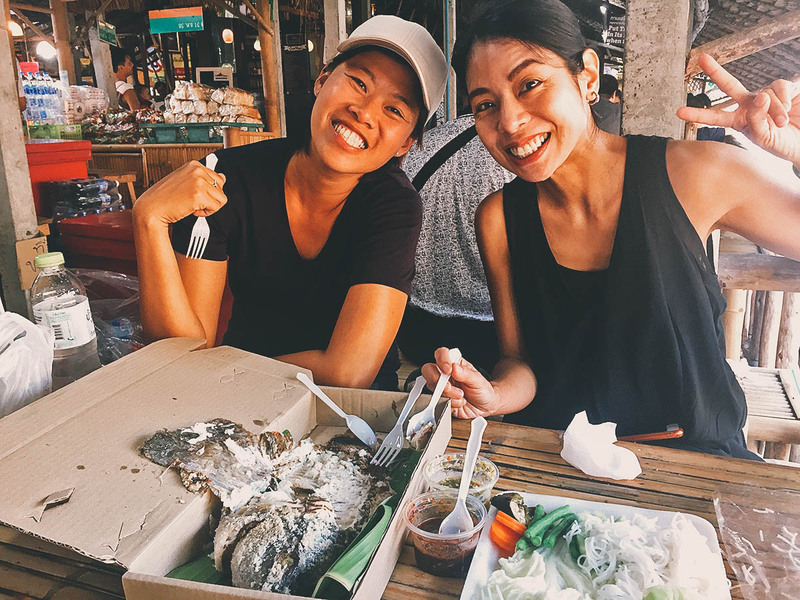 We wanted to experience an authentic floating market, one frequented mostly by locals, so we went to Khlong Lat Mayom instead. Khlong Lat Mayom Floating Market is open only on weekends, from 9AM-6PM on Saturdays, Sundays, and public holidays. We didn’t do it but I’ve read you can take 2-hour longtail boat ride tours from here. One goes to the lotus pond and the other to Taling Chan, which is another floating market located not too far from this one. 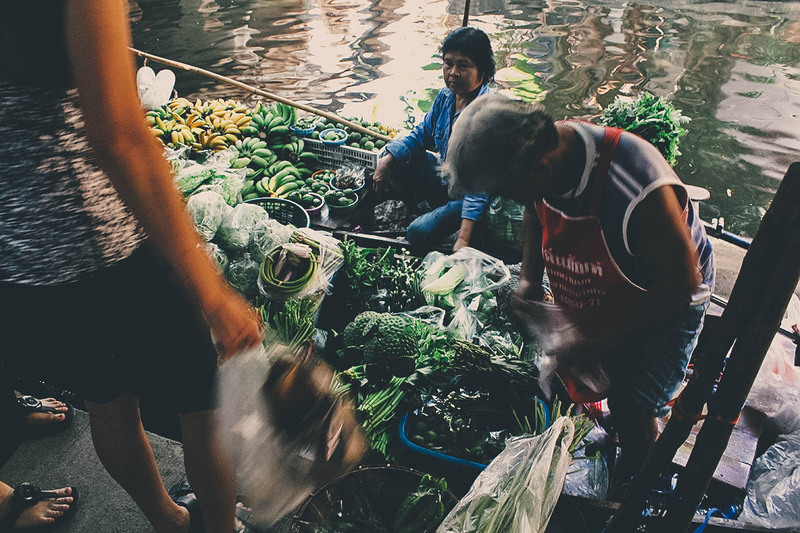 Natt explained that the term “floating market” doesn’t mean the entire market is floating on water. It just means that the market is located by a canal or waterway. There are indeed a few of these boats selling fruits and vegetables but most of the vendors sell their wares from stalls on land. When they hear of Bangkok floating markets, many tourists have this picture in their head of hundreds of boats in the water selling food, flowers, and other colorful wares. If that’s what you’re after, then you’re better off going to Damnoen Saduak or Amphawa Floating Market. It makes for a great photograph but as described, the experience is hardly real anymore. Both markets are known to be very touristy with inflated prices, scammers, and many vendors selling things like fake designer bags and watches. Not exactly our idea of a floating market! Khlong Lat Mayom is a much smaller floating market with just four or five of these boat vendors. When we were there, only one vendor was cooking and selling food from her boat. It looked like some type of fritter. It smelled really good! 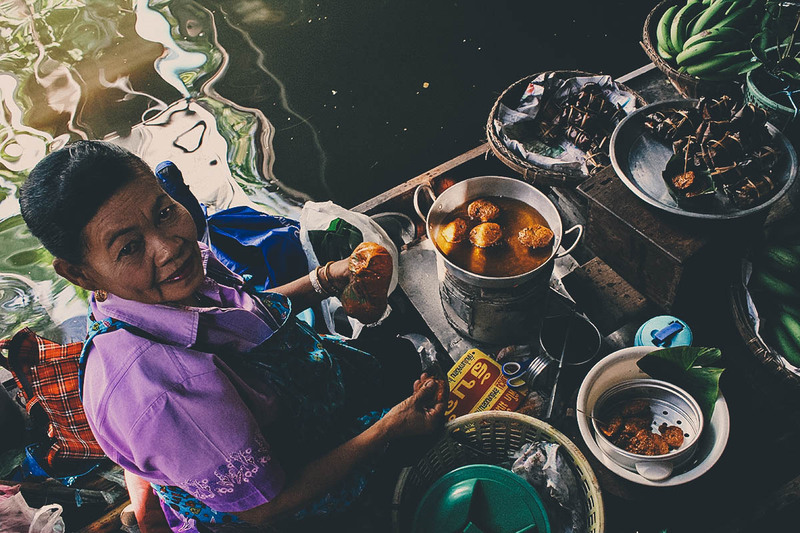 As described, the great majority of Khlong Lat Mayom Floating Market is comprised of these stalls selling all kinds of delicious-looking Thai food. 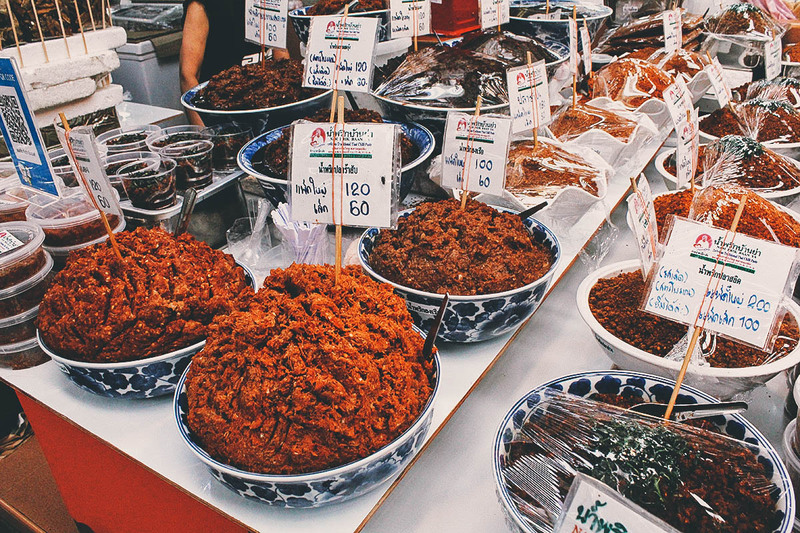 If food is what you’re after, then this is a great market to visit. Unfortunately, many stalls were closed because of the Royal Cremation Ceremony. According to Natt, the market wasn’t as busy as it usually is though it did become more lively closer to noon before we left. I can only imagine how much more fun it would be on a regular weekend. 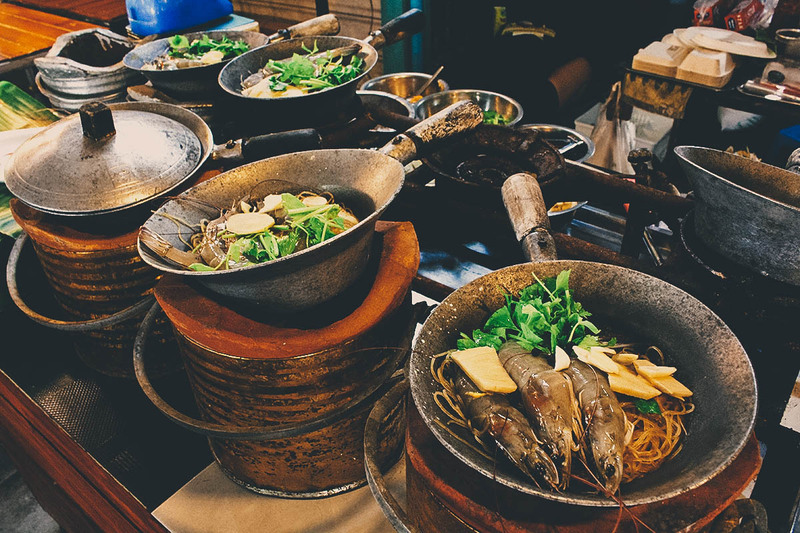 Here’s a vendor selling goong ob woon sen or claypot shrimp with glass noodles. Doesn’t it look delicious? I wanted to try this but I needed to hold back with everything we’d be eating today. Here’s some Thai bird’s eye chili with a mountain of what looks like freshly grated papaya and carrot. Pork belly two ways – salty and sweet. Ren loves pork belly so we couldn’t resist trying this. We eat pork belly all the time but we’ve never had it like this before. 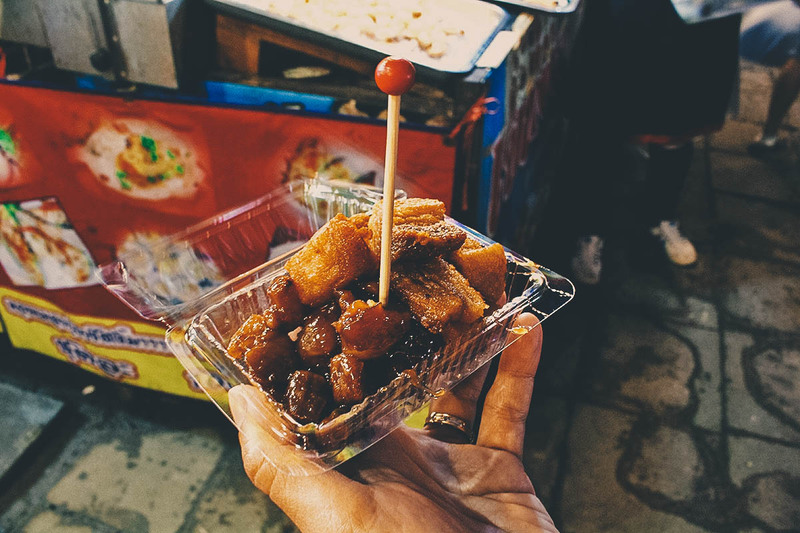 Like a candied version of pork belly, it was covered in a thick, dark, gooey syrup that stretched away in strings each time you grabbed a piece. Both versions were delicious and it was fun alternating between the two. I think it cost THB 60 for this small container. These were super delicious. We’ve only had tako at Thai restaurants outside of Thailand so it was nice to try the real stuff. 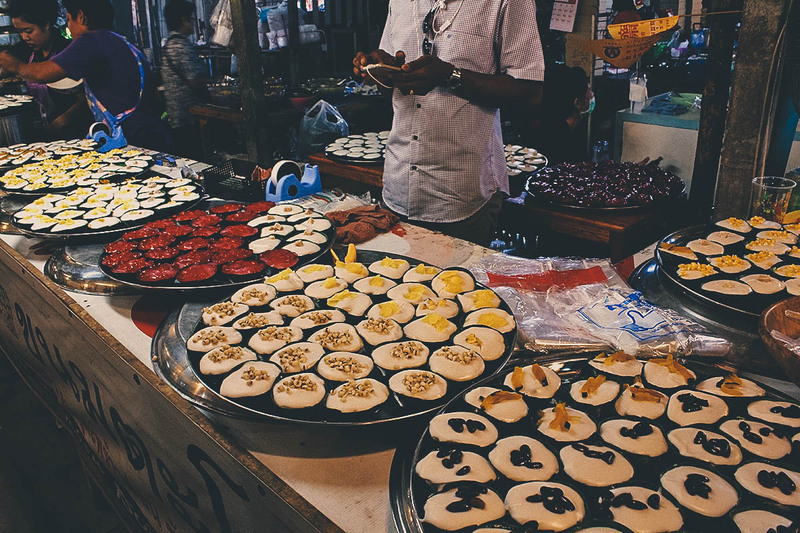 This stall offered several varieties of tako, which is a Thai pudding dessert topped with coconut custard. This is what they looked like before being covered with the coconut custard topping. These look like they’re topped with black eyed peas. We came back a few minutes later and found them topped and ready to eat with that delicious coconut custard. If I remember correctly, they cost something like THB 25 apiece, maybe even less. They were so good Ren and I wound up coming back for seconds. We love tako but this was the first time we tried them fresh. They tasted even better! Huuuge shrimp! I think these are giant freshwater shrimp. 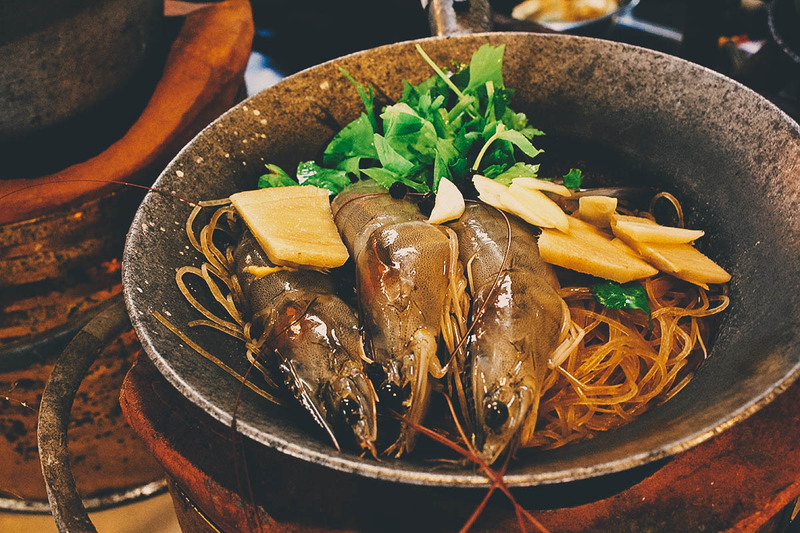 We call them ulang in the Philippines and typically eat them in a dish similar to tom yum called sinigang. A selection of dried cured meats. 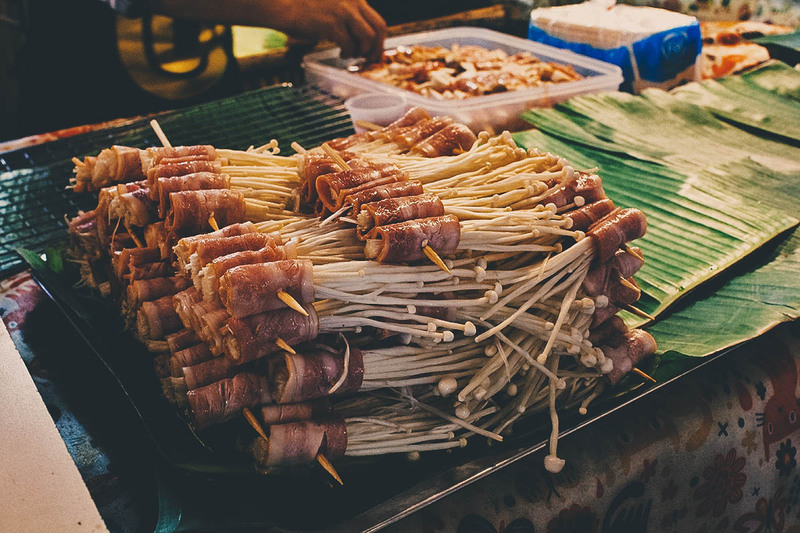 These are a popular snack in the Philippines too. 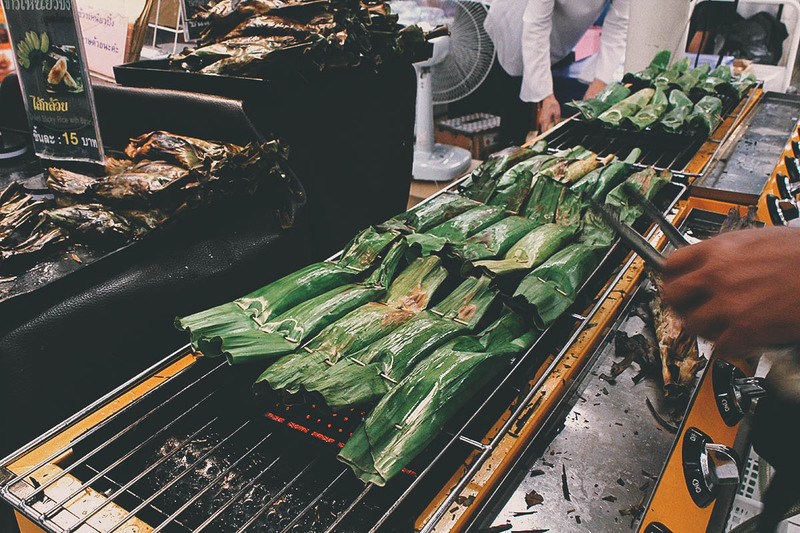 Several tables were enjoying pla pao or salt-crusted grilled fish. 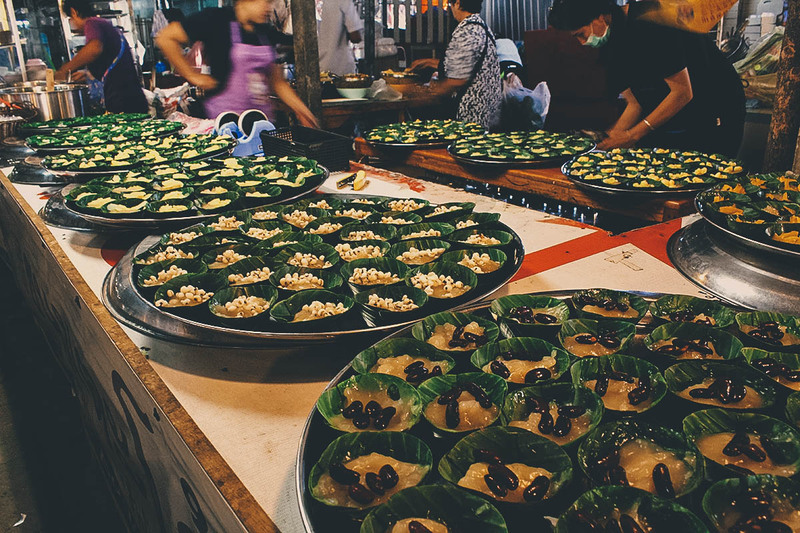 According to Natt, they’re a popular dish at floating markets so we had to try it. 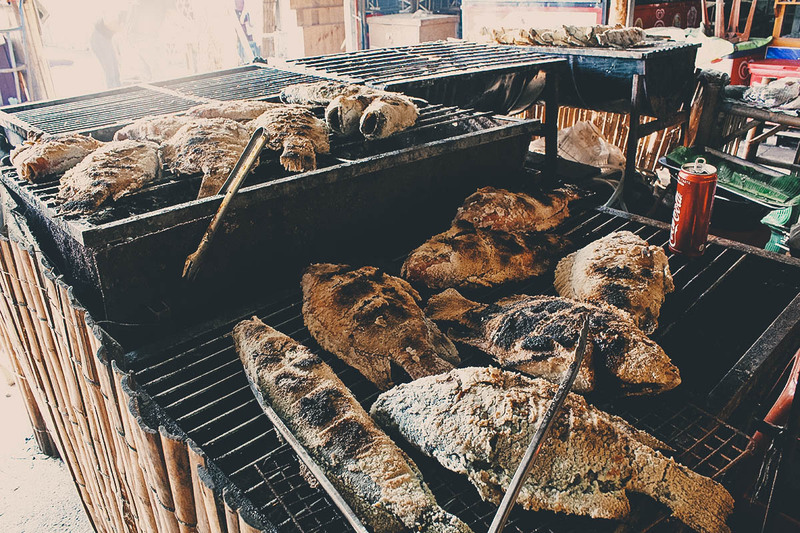 They were grilling tilapia and snakehead fish at this stall. I think the very nice vendor was amused by our enthusiasm because he gave us a good-sized tilapia for just THB 160 (normally THB 180). Thank you! 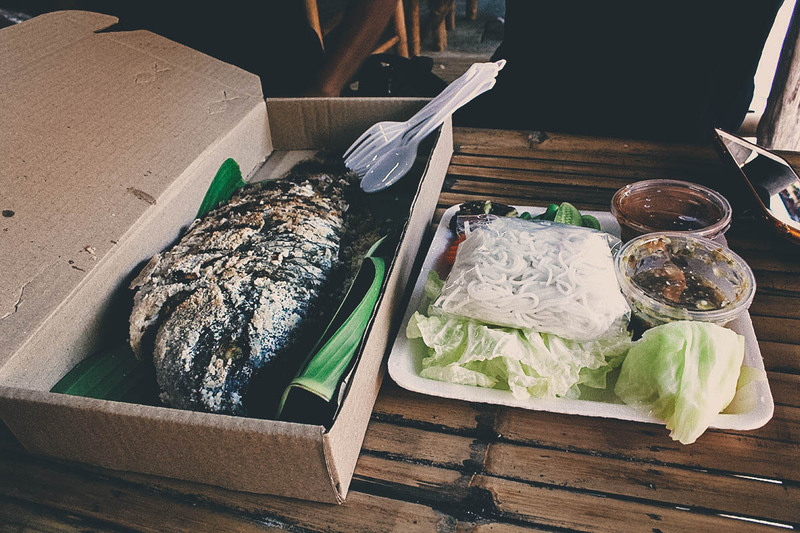 The whole crusted fish is served in a box with a side of rice noodles, vegetables, and a duo of sauces. 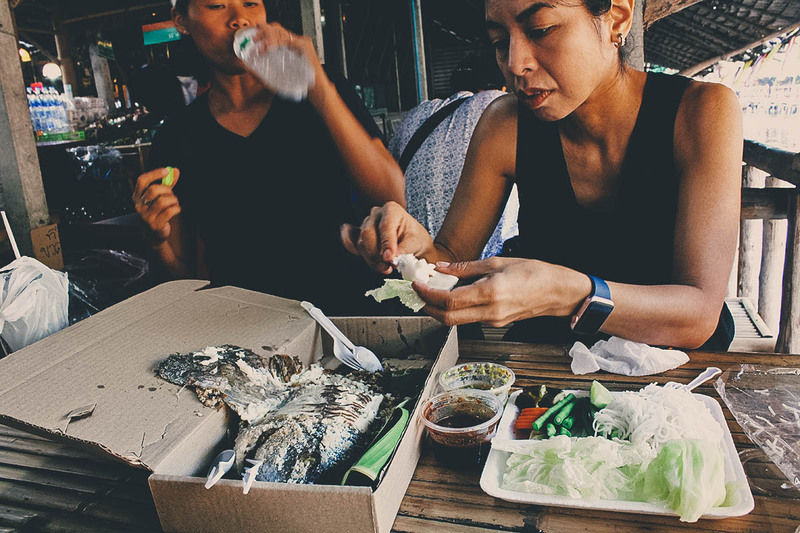 The tilapia in Thailand are huge. 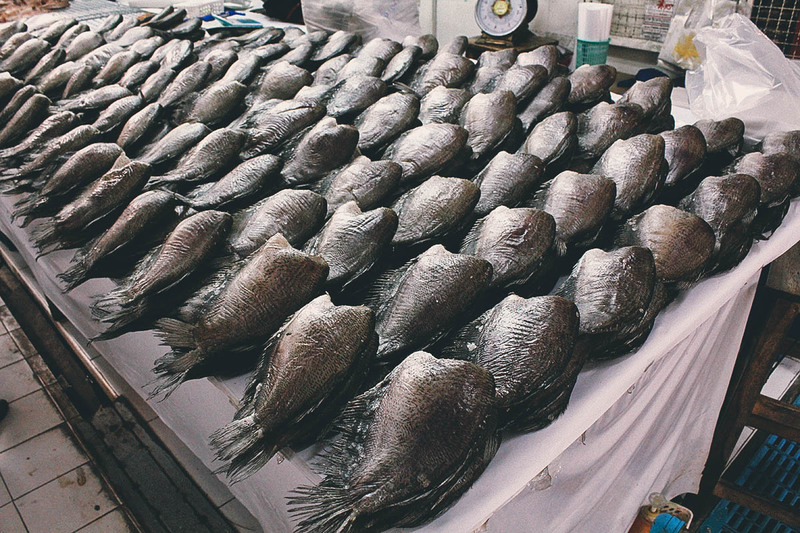 I’ve never seen tilapia this big in the Philippines! You take chunks of the fish and wrap it in lettuce leaves with noodles, veggies, and some sauce. It was moist and smokey and absolutely delicious. It didn’t take us long at all to polish off that entire fish. 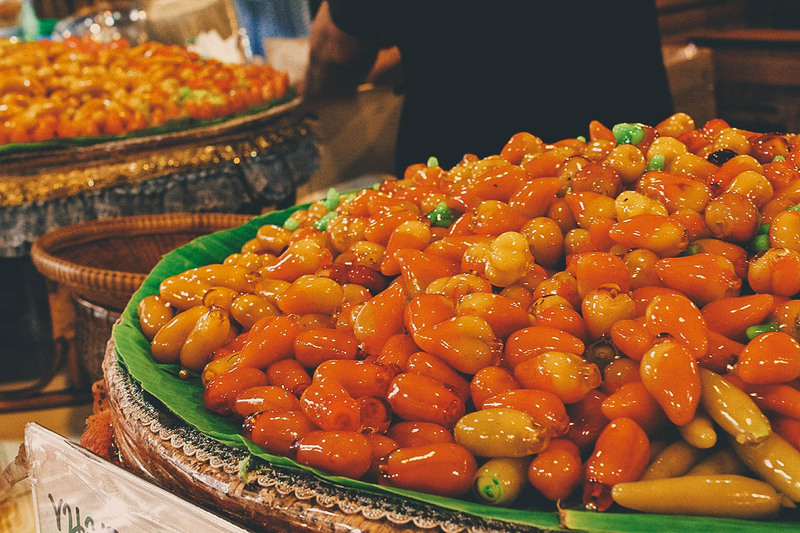 These glossy beads of goodness are called luk chub. 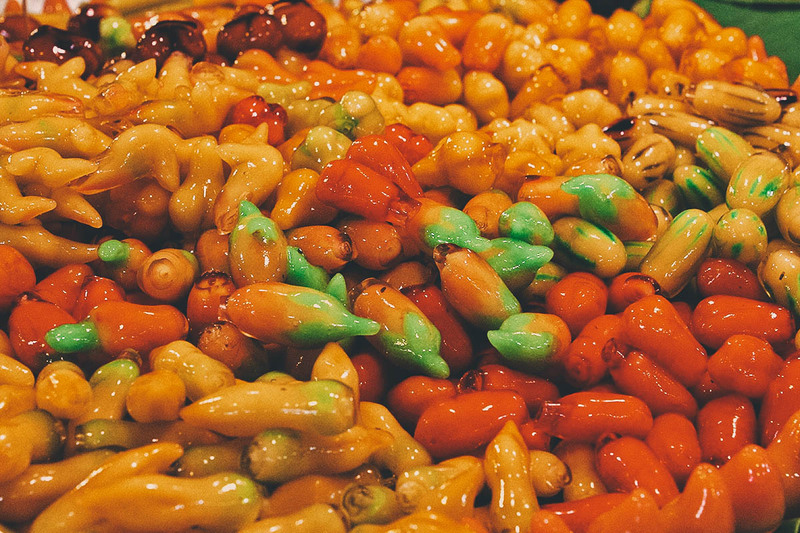 They’re made with mung beans and shaped like miniature fruit. Aren’t they pretty? They look almost like pendants or something. 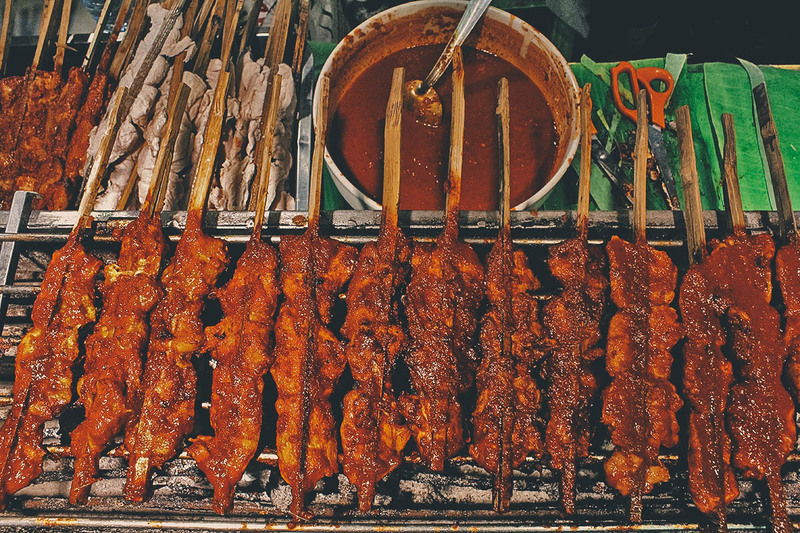 Pictured here are skewers of gai galae, or Thai grilled chicken from Southern Thailand. 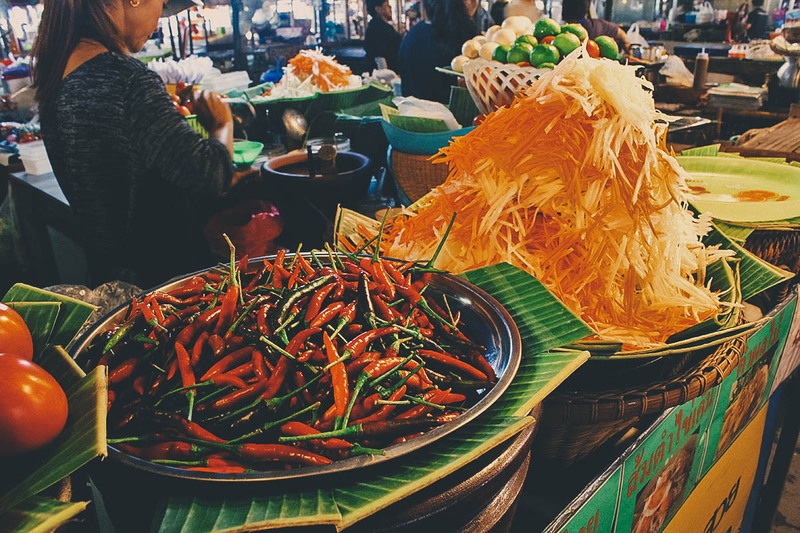 From what I’ve read, southern Thai cuisine is known to be quite spicy. One of the things I enjoy most about visiting markets in Thailand is discovering strange and unfamiliar fruit. These odd-looking specimens are called sala or snake fruit. We didn’t try any but they’re described as being sweet with a burst of acidity. Very cool! 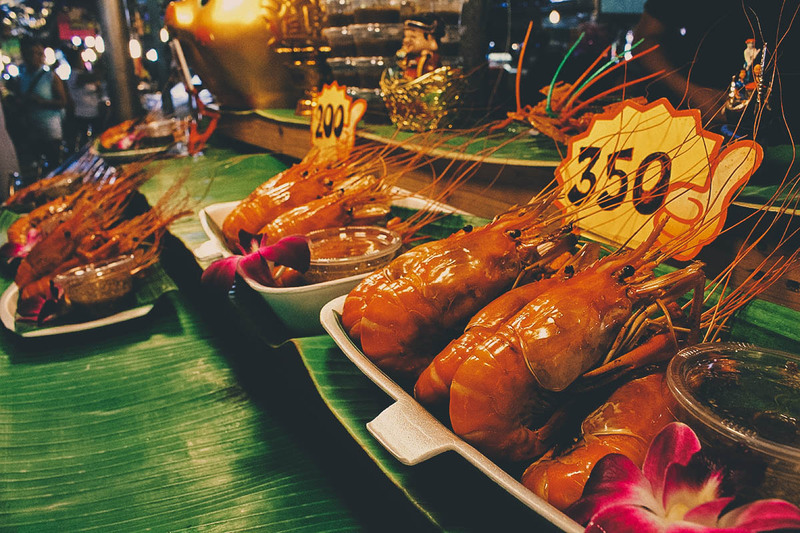 We had an awesome time at Khlong Lat Mayom Floating Market in spite of it being less vibrant than usual. With more time, we easily could have stayed the whole day here trying as much Thai food as we could. I would have loved doing one of the longtail boat tours as well. 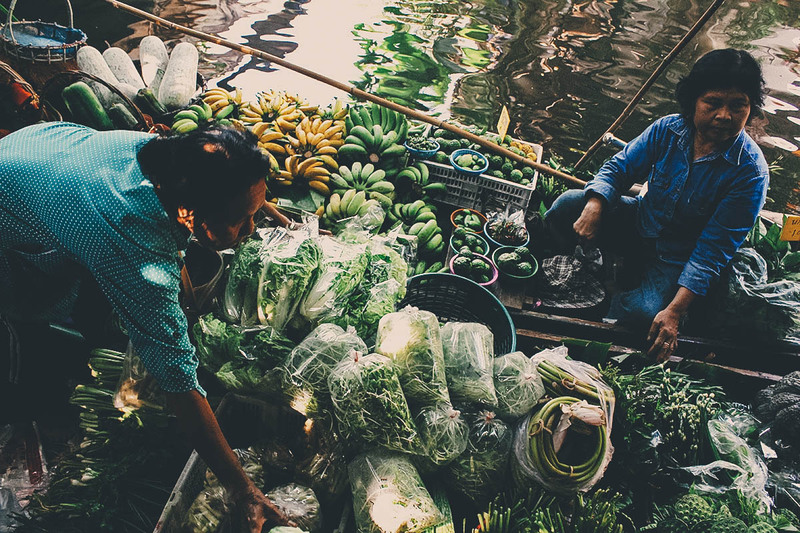 As described, we chose Khlong Lat Mayom because it’s one of the most authentic floating markets. 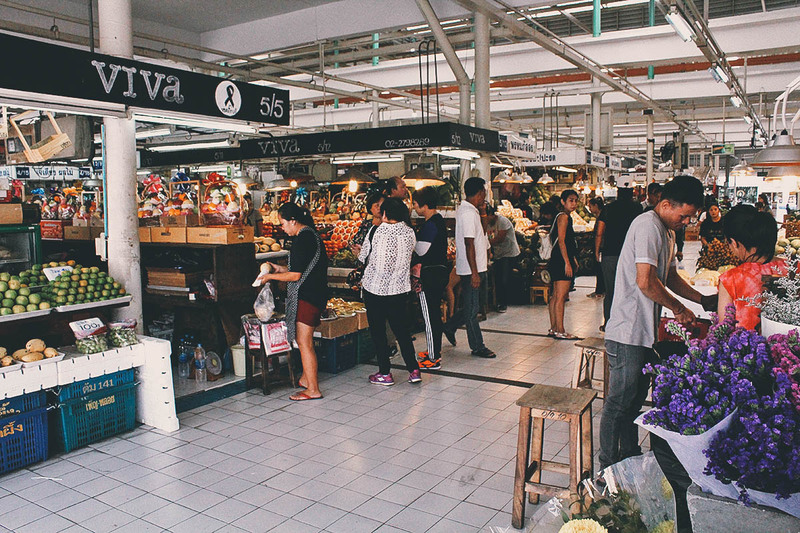 It’s a smaller, quieter market frequented mostly by locals, which is exactly what we wanted. Though it isn’t far from Central Bangkok, it’s a bit out of the way so it’s best to go via Uber or taxi. Again, if what you’re after is a big floating market with hundreds of boats on the water, then Khlong Lat Mayom probably isn’t for you. You’re better off going to Damnoen Saduak or Amphawa Floating Market instead. How to Get There: There’s no easy way to get to Khlong Lat Mayom Floating Market by public transportation. The best way is to go by Uber or Taxi. Natt paid for the taxi so I don’t know how much it cost, but I believe it’s around THB 200 or so from Central Bangkok. From Khlong Lat Mayom, we took a taxi to our next stop, Chatuchak Market. Ren and I have been to Chatuchak Market a couple of times before so we only made a quick stop here. Actually, I made a quick stop here. Ren knows how hot it can get inside the market so she wanted nothing to do with it. 😆 She and Natt sought refuge in an air-conditioned cafe while I took pictures and shot some video at the market. 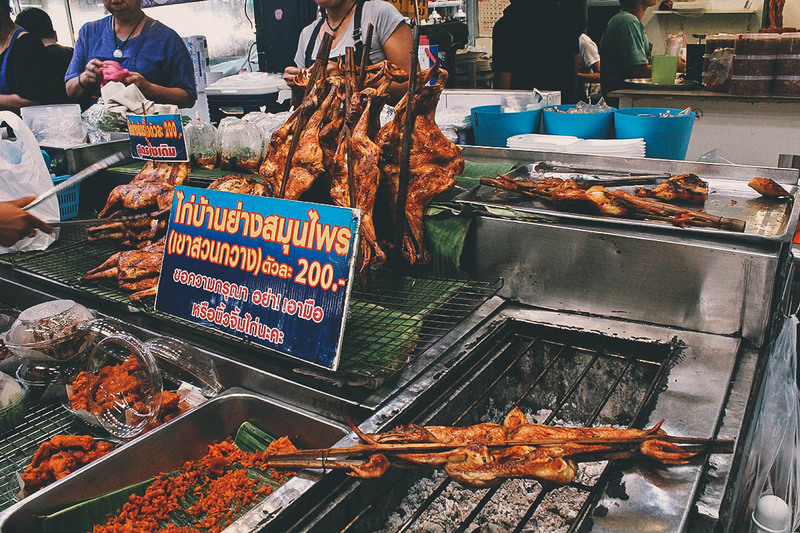 Open only on weekends, Chatuchak Market is a 35-acre market in Bangkok that’s home to over 8,000 stalls. 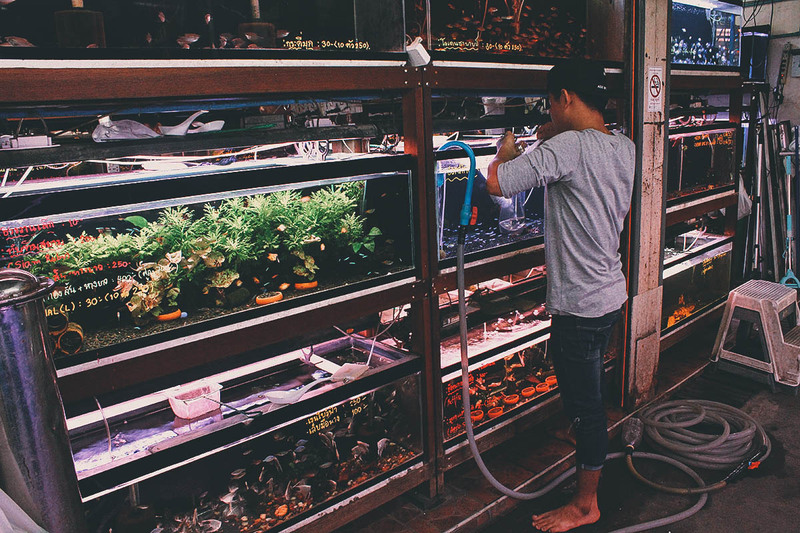 They sell everything from clothes, to handicrafts, to home accessories, food, plants, art, and pets. Whatever you need, chances are you’ll find it here. This place is absolutely MASSIVE. Before they left to go enjoy some coffee and cake, Natt warned me not to get lost because Chatuchak Market is like a giant maze and she will NOT be able to rescue me. 😆 With all its alleys and dozens of sections, it isn’t hard to lose your bearings here. I had been here before and had no intention of shopping or exploring so I stuck to the pet section, where they left me. 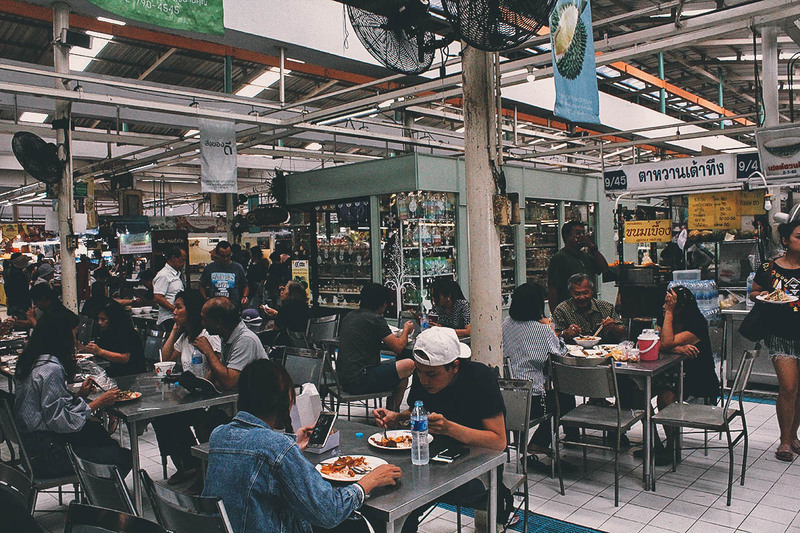 I read that Chatuchak Market used to be popular only with wholesalers and traders but it’s become a must-visit tourist destination. If you’re visiting Bangok over a weekend, then I suggest spending a day here. There is so much to see and do. As previously mentioned, Ren and I have been to Chatuchak Market before so we had no intention of staying long today. We made a quick stop here only because it’s adjacent to our next destination – Or Tor Kor Market. 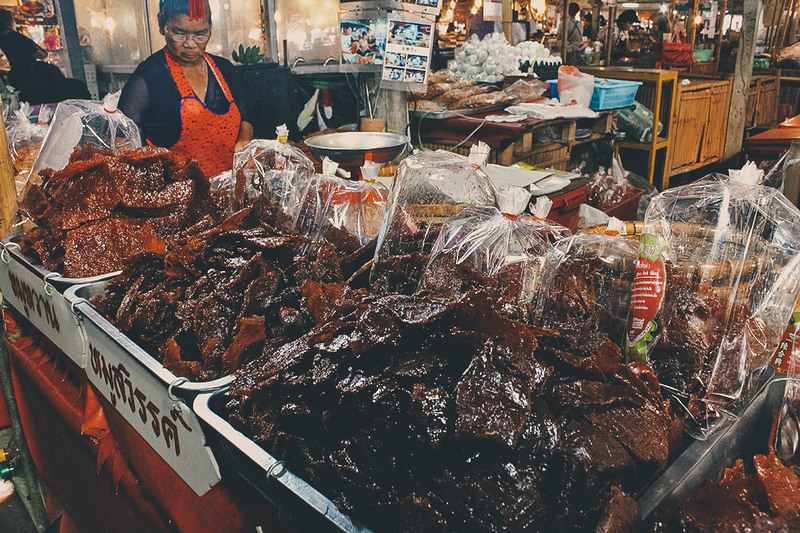 But if you’re visiting Bangkok and have never been to Chatuchak Market, then it’s a good place to visit. You’ll go crazy over all the things you can buy here. Personally, I find it a little too overwhelming. How to Get There: Take the BTS Skytrain to Mo Chit Station. Take exit no. 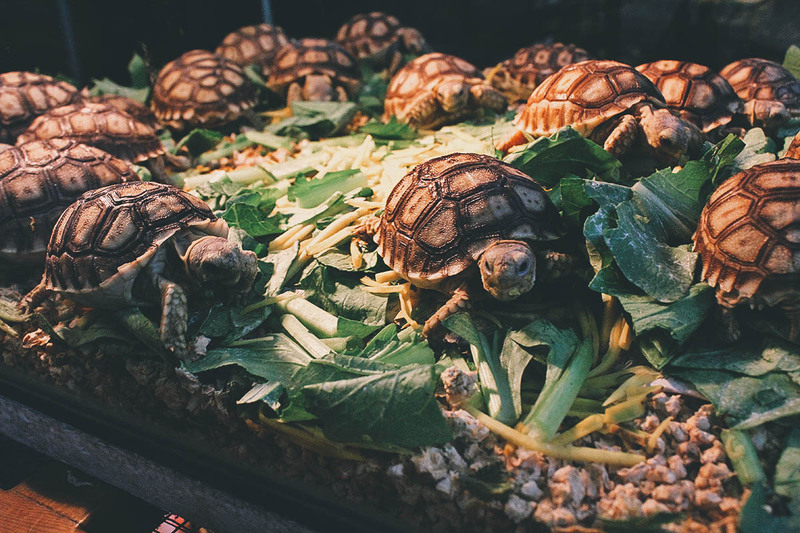 1 and follow the crowd to the market. Chances are, that’s where everyone is going. 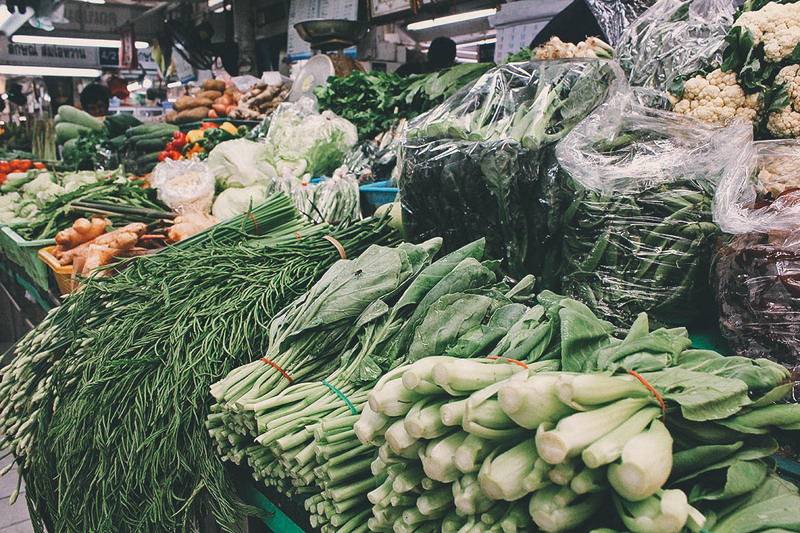 If you’ve never heard of Or Tor Kor Market, it’s an exceptionally clean market known for selling only the highest quality produce. It’s brightly lit with no market smell at all. 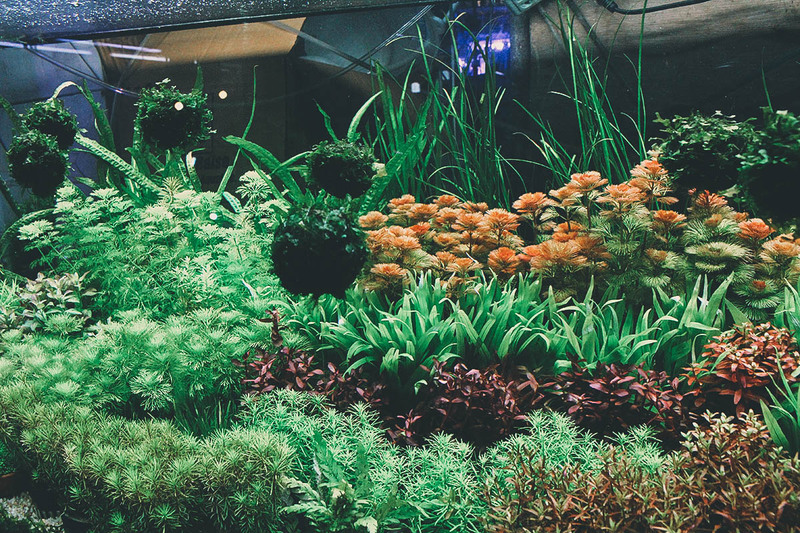 If I were to imagine a hybrid between a wet market and a department store, then it would be something like this. 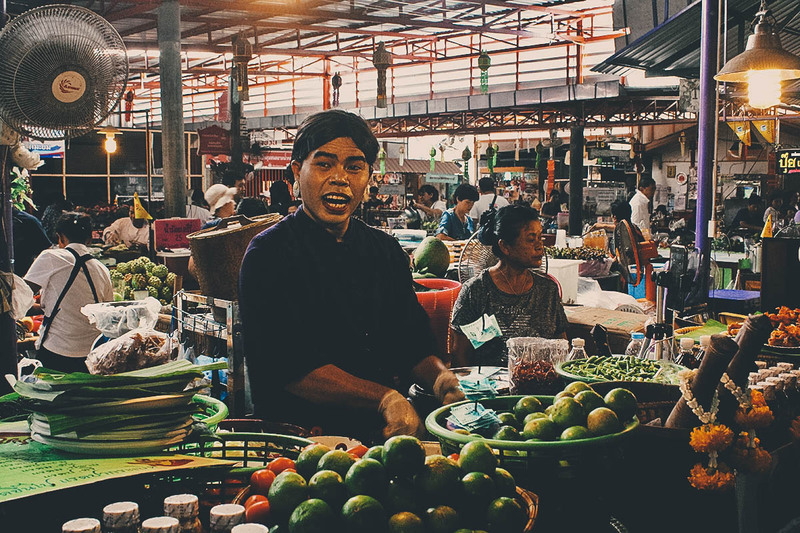 In fact, so highly regarded is this market that it was named one of the world’s 10 best fresh markets by CNN. 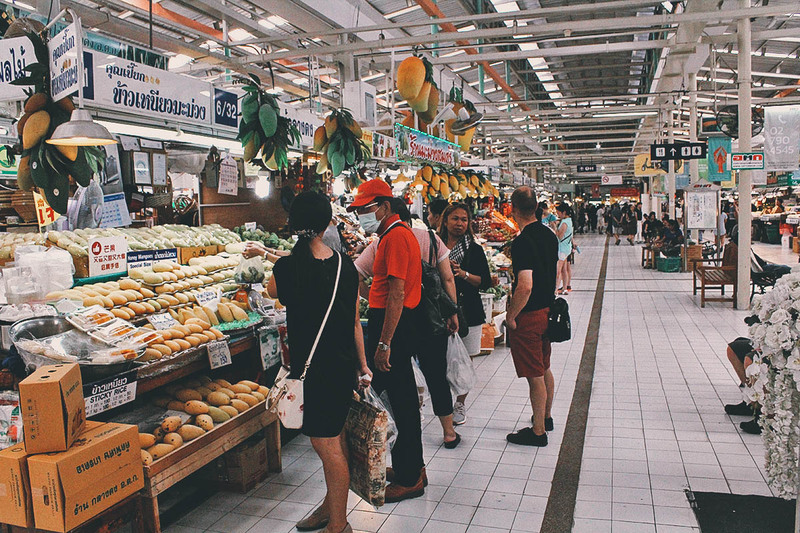 The produce here is more expensive than at other markets in Bangkok but as Natt described, you’re always guaranteed of the quality. The fruits for example, look perfect. Does anyone know what these things are? They looked cool. Aside from fresh produce, they sell plenty of cooked food here as well. 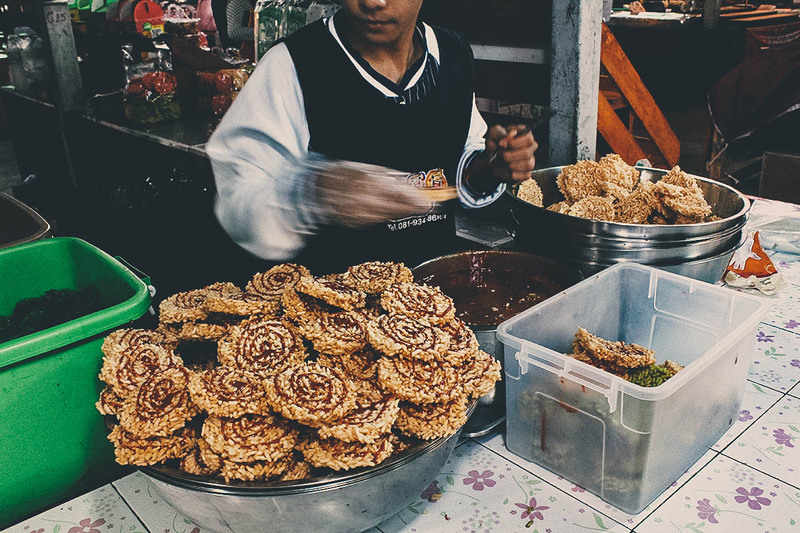 I think these are a type of Northern Thai sausage made with fermented pork called sai krok isan. I think these are tilapia. These looked really good. 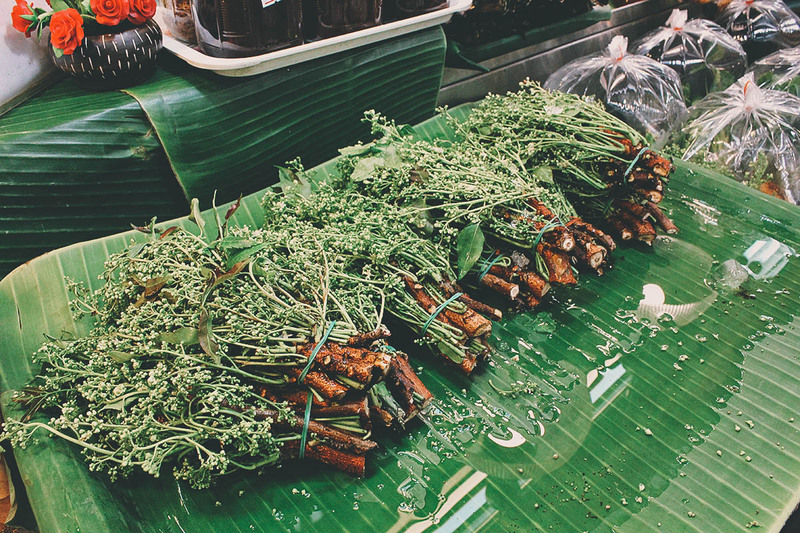 If I remember correctly, they were bananas with sticky rice grilled in banana leaves. 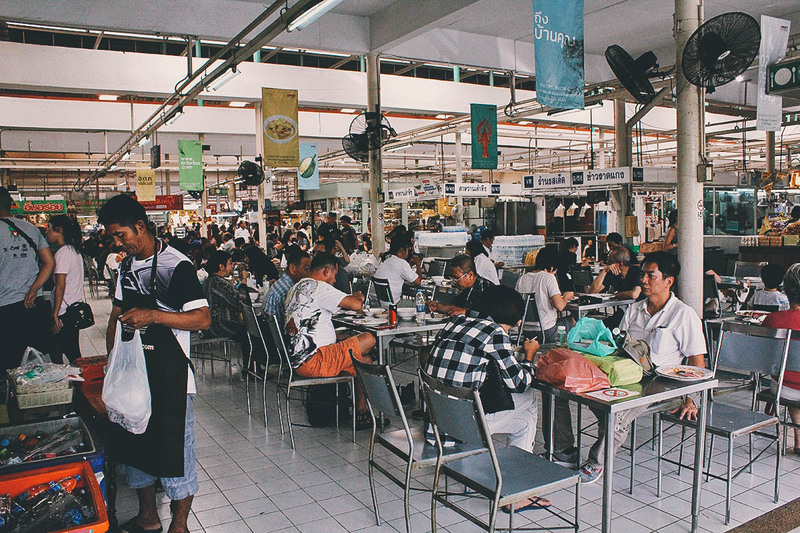 Or Tor Kor Market also has a food court section with several stalls to choose from. We had our last meal of the tour here. The place gets pretty crowded so it’s probably best to come early or late to avoid the lunch rush. This awesome little stall was where Natt took us for lunch. 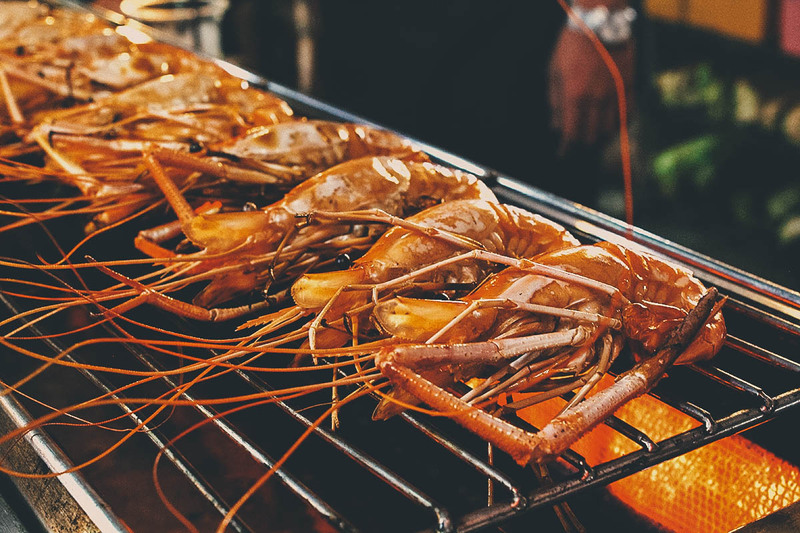 Located at stall 11/40, they’re known for serving delicious Pad Thai and hoy tod (oyster or mussel omelette). According to her, this is the only place where her dad will eat hoy tod. That’s all the endorsement I need! I love mussels too but many people online seem to prefer oyster between the two, so that’s what we went with. 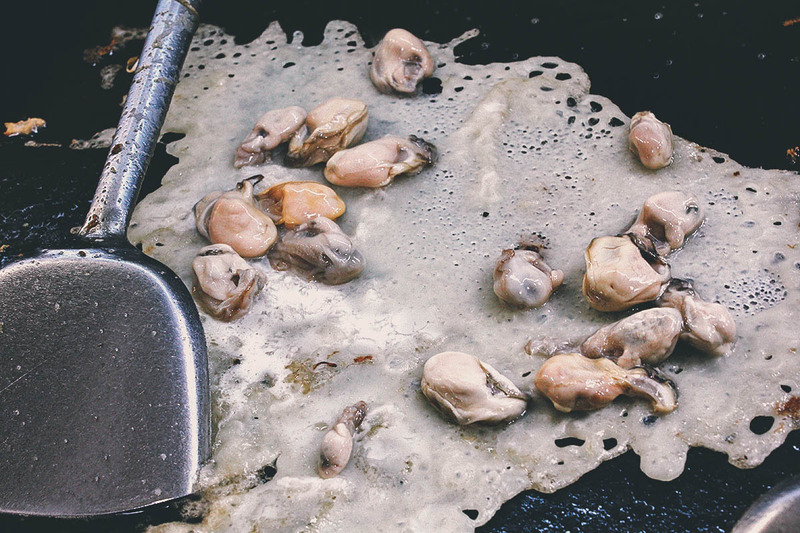 A pancake-like batter goes into the hot skillet first before being followed by plump juicy oysters. While cooking, the woman making the hoy tod continuously added oil to the pan. This was to ensure that the omelette becomes as crisp as possible. Crispy indeed! 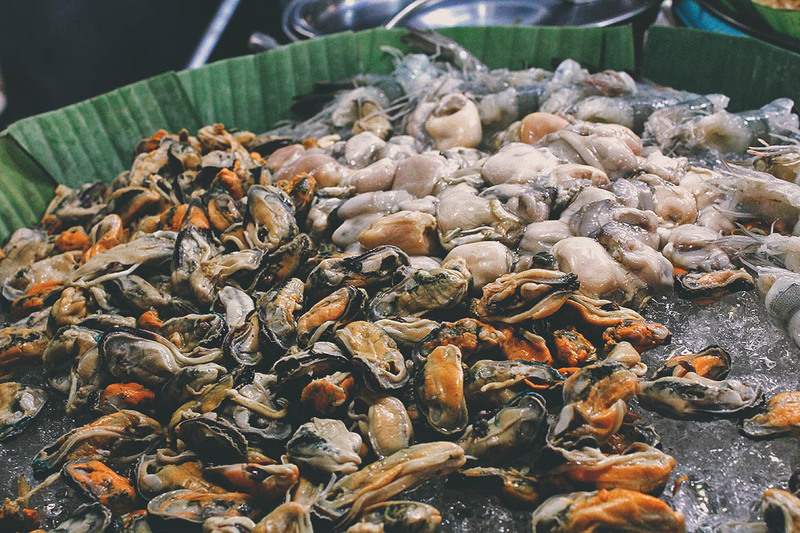 Oysters are one of my favorite foods so hoy tod is a dish I would happily order again and again in Thailand. You’ll find many versions of oyster omelette in Asia. 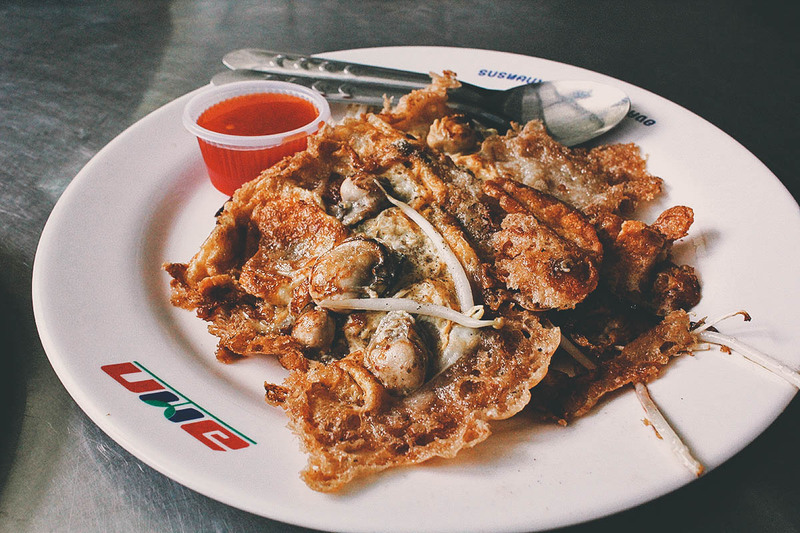 Most recently, we’ve had it in Penang and Taiwan, though this Thai version is probably the crispiest. 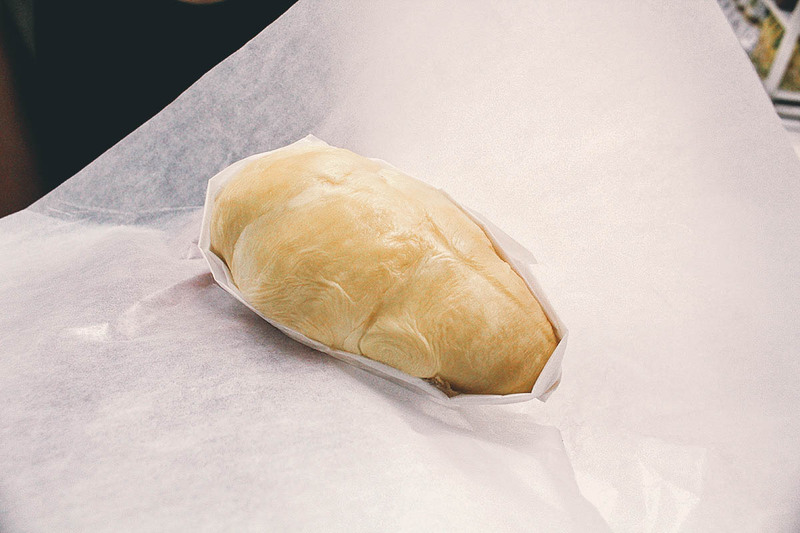 It’s also one of the oiliest so you may want to eat it with that tangy red sauce to cut the greasiness. It isn’t one of the healthiest dishes around but it’s absolutely delicious. Here’s a plate of their equally delicious Pad Thai. 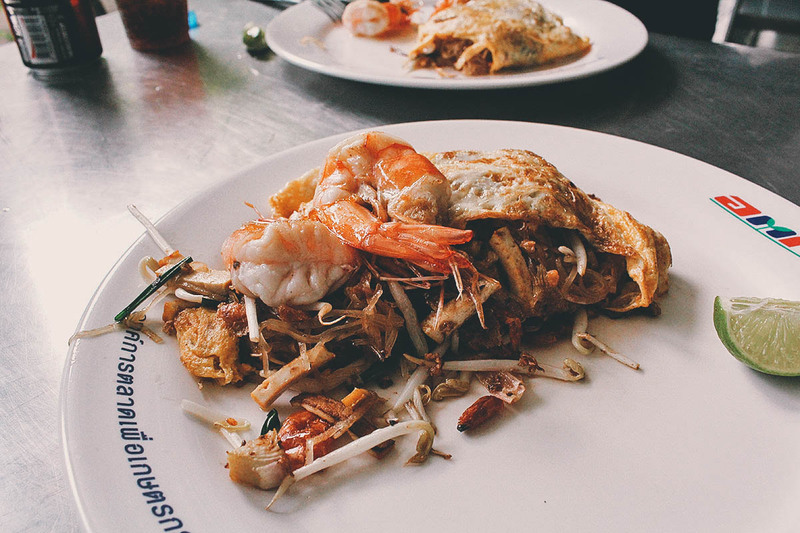 People have their opinions when it comes to the best Pad Thai in Bangkok, but honestly, I’ve never met a Pad Thai here I didn’t like. We had Pad Thai later that night at the ultra-famous Thipsamai, and I enjoyed them both equally. So damn good. 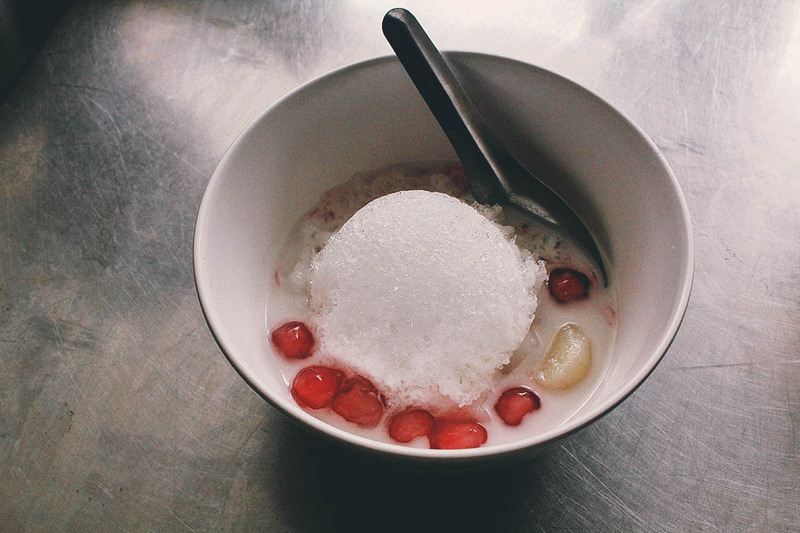 For dessert, Natt introduced us to this Thai dessert called tub tim grob or Thai red rubies in coconut milk. 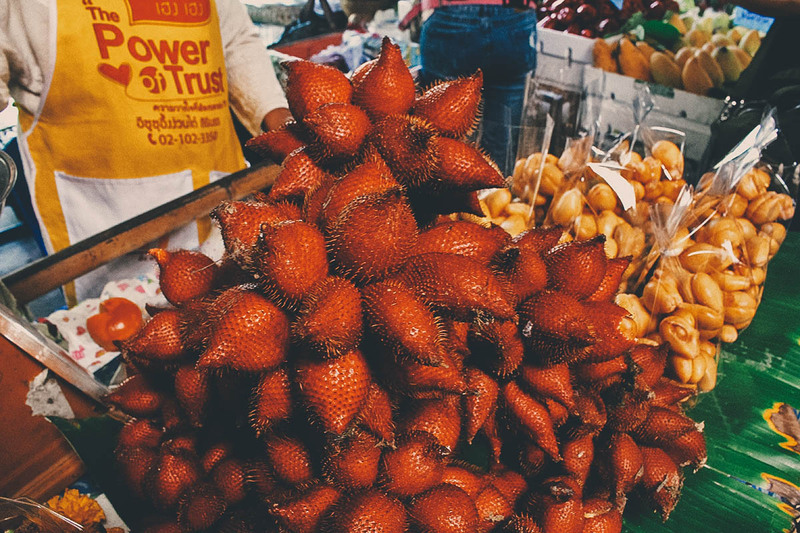 The red rubies are actually water chestnuts which are peeled then diced and coated with red food colouring. 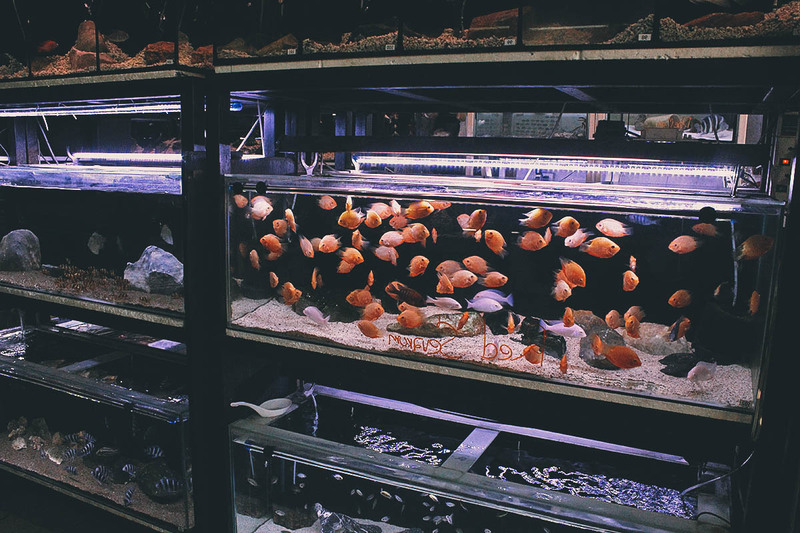 They’re dipped in tapioca flour and boiled in water, giving them that translucent reddish coating. 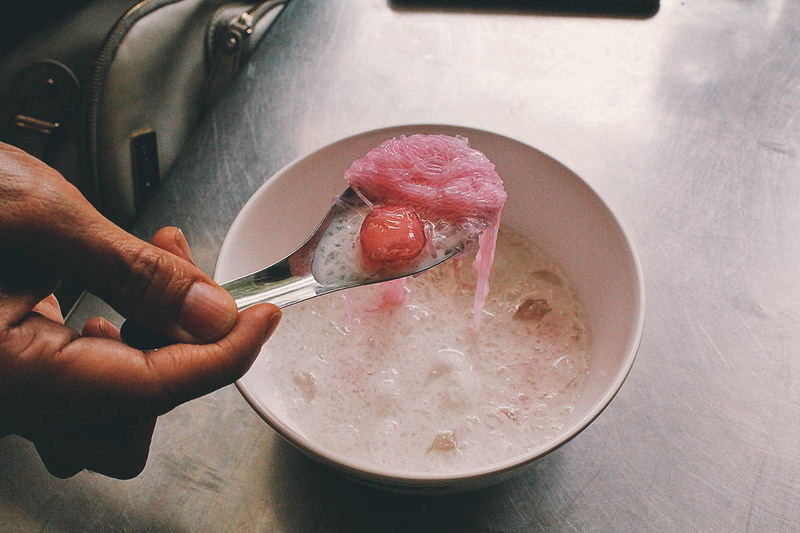 I looked at recipes online and it seems that this dessert is typically served with just sweetened coconut milk and shaved ice. 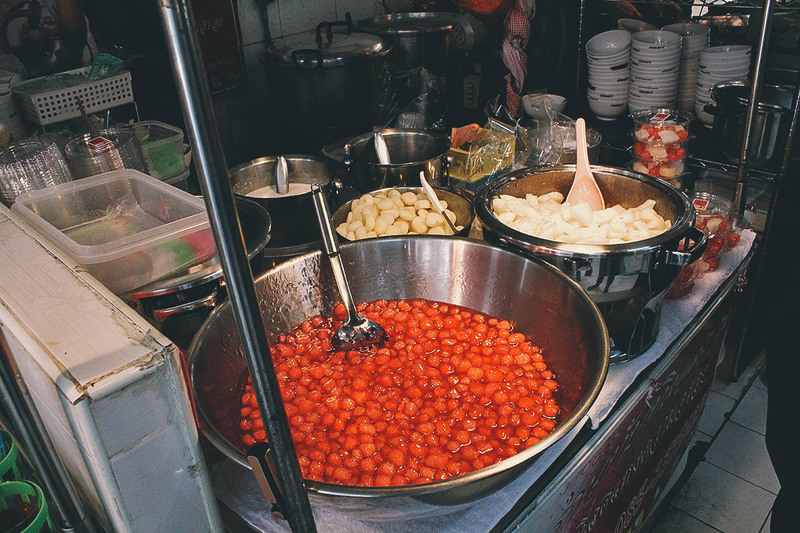 But this version also had bigger chunks of water chestnuts and “sweet noodles”. Those red rubies are interesting. You don’t expect them to be crunchy because of their color, but they are. You think they’ll be jello-like but they still taste like water chestnuts. This dessert is delicious and very refreshing. Remember how I said there’s something I’ve been wanting to do here ever since I saw this video by Mark Wiens? If you know who he is, then you can probably guess what I’m talking about. The picture below is a clue. If you don’t, then click on the link and forward to the 8:10 mark of the video. Like I said, I love durian. I’m not an expert on the many varieties but this one was sensational. It was creamy, custardy, and oh so delicious. I know many people are put off by the smell but it doesn’t bother me one bit. Here we are after lunch and before we parted ways. Ren and I were going on a tuk-tuk night tour that same evening so we went home to rest and digest all that food we ate. 😆 Thank you so much Natt for taking the time to show us around Bangkok! 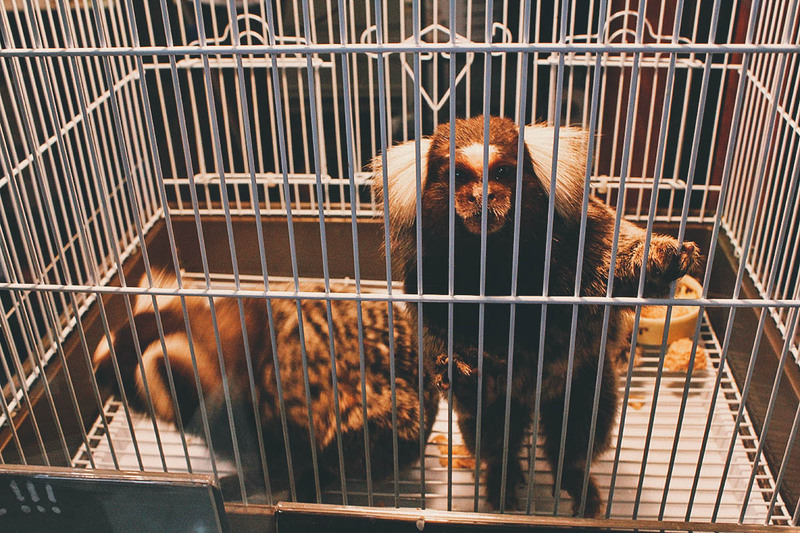 We loved every minute of it and we hope to see you again on our next trip to Thailand. 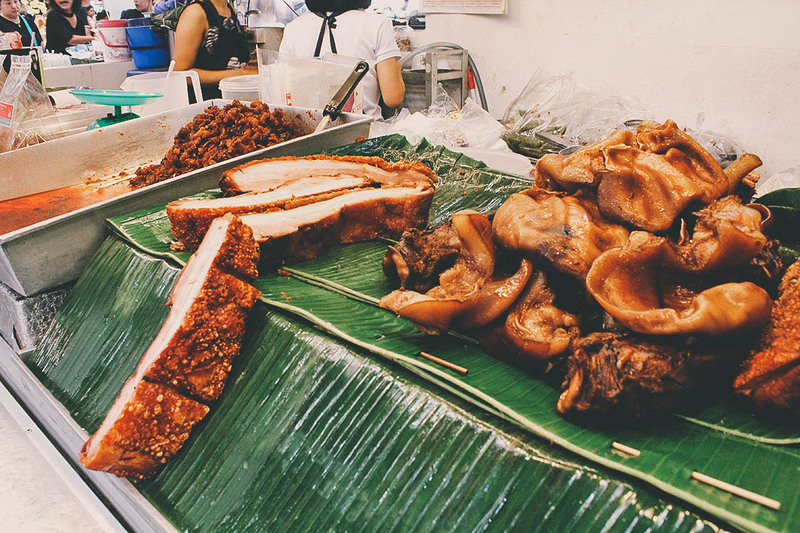 If you enjoy food and visiting local markets, then you have to go to Or Tor Kor Market. 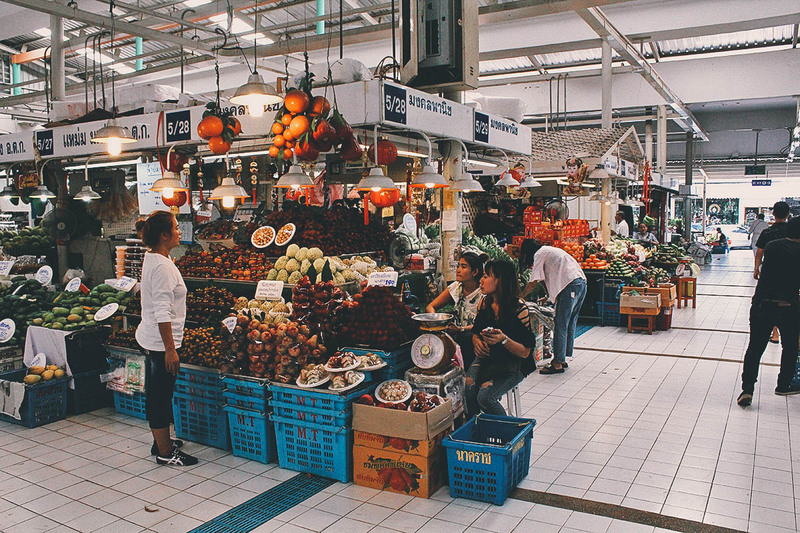 Bright and spotlessly clean, it’s unlike your typical Asian market. As described, produce is more expensive here but the quality is second to none. 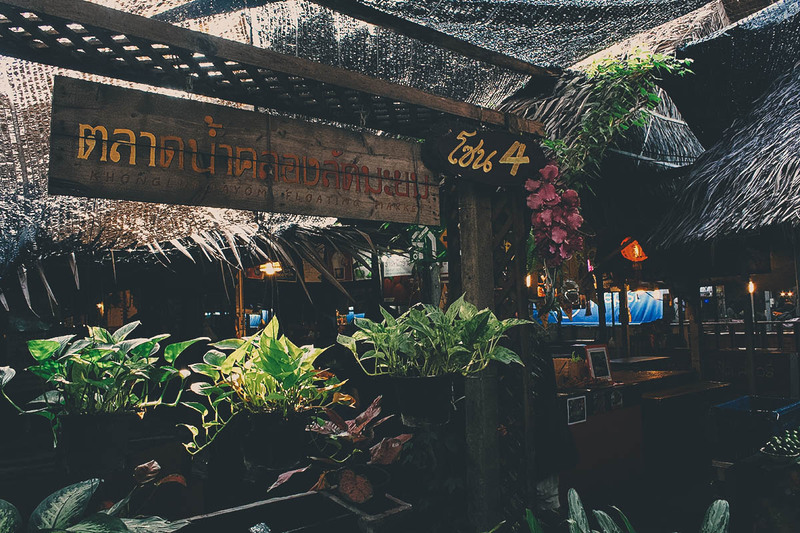 It’s very close to Chatuchak Market so you can do both on the same day. I suggest having lunch here instead of Chatuchak Market. The food will be better. I’ve never been too big a fan of Chatuchak Market but I absolutely love this place. 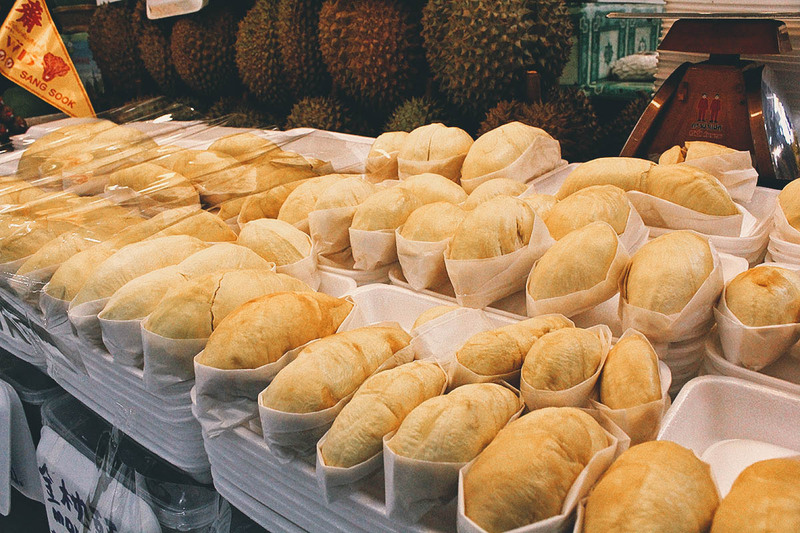 We will definitely be coming back here (and eating more durian) on our next trip to Bangkok. Bangkok is a sprawling metropolis with much to offer. With all its temples, markets, street food stalls, and shopping centers, you can explore the city on your own and not run out of things to do. Even though we’ve been to Bangkok several times before, the five days we spent there on this trip felt rushed and not nearly long enough. There was still so much we wanted to do! 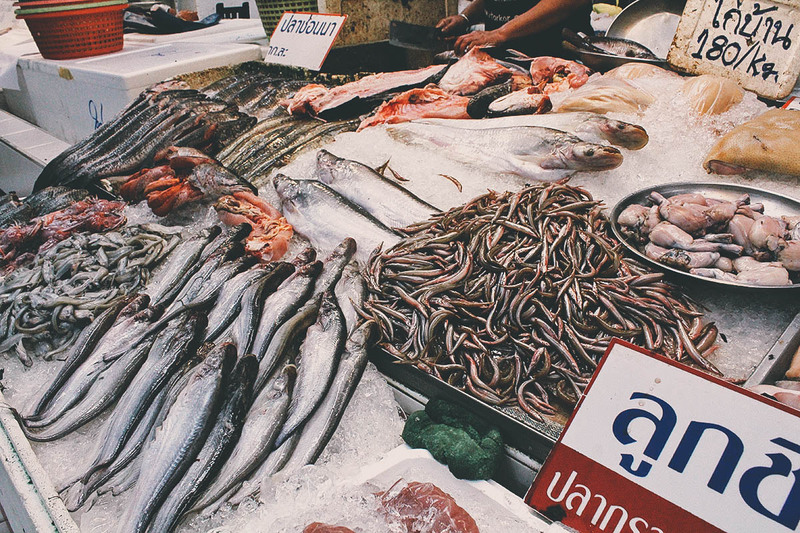 Bangkok is easy enough to see on your own but as an outsider, you’ll only be scratching the surface. 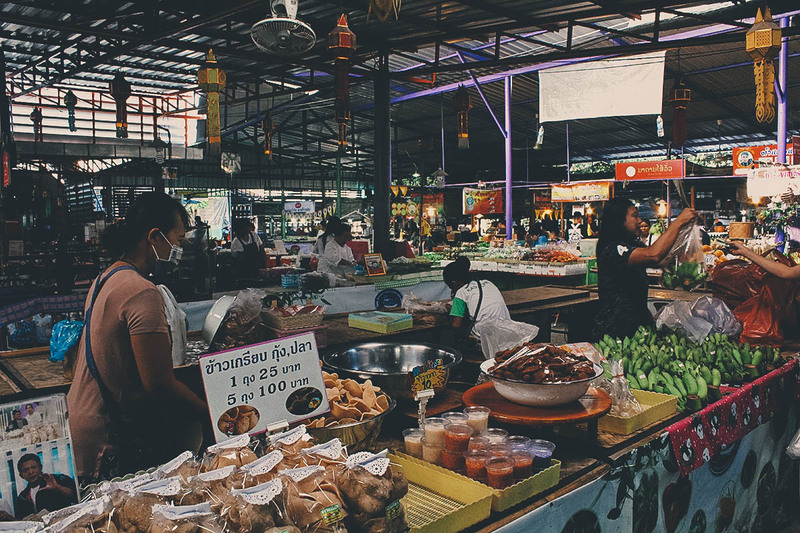 If you want to go deep into Bangkok and experience it like a local, then you may want to hire a private tour guide, especially if there’s something specific you wanted to do. 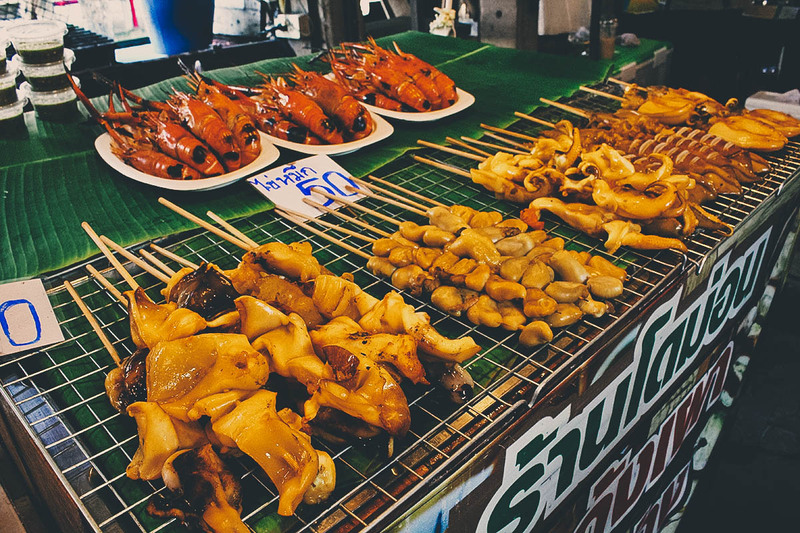 Simply put, no one knows Bangkok better than someone who actually lives there. We had such a good time with Natt that we started talking about what we could do on our next trip to Bangkok. Apart from running Your Thai Guide, she’s also an animal behaviorist so we talked a lot about dogs, elephants, and animal rescue. Thanks to her, we learned about an elephant sanctuary not too far from the city. 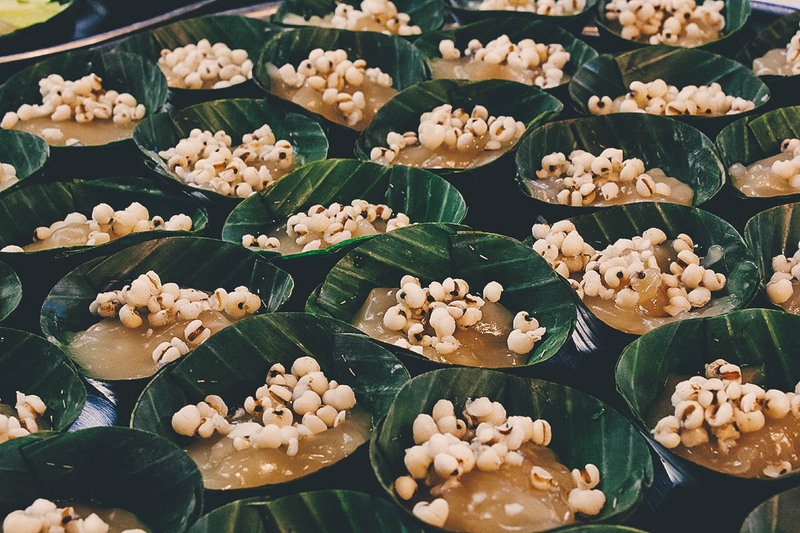 It sounded amazing and something we’ll definitely look into on our next trip to Thailand. Natt reached out to us in November 2016 and offered to take us on a private tour should we ever visit Bangkok. I reconnected a few weeks before our trip in October 2017 and told her we wanted to visit local markets. She agreed and came up with the above itinerary. We didn’t pay for her tour guide services but we did pay for all the meals on that day. As always, all words and opinions expressed in this post are mine and mine alone. Thailand is very beautiful but nothing can match Bangkok.Bangkok is very advanced and is a nice place to spend a quality time.But the main factor there is speaking.Their people don’t speak English, they prefer to speak their own language. That’s true Ashley. Bangkok is an exciting place but the language barrier can be a problem.